This is a 1kg size jar of Manuka Doctor Active Manuka Honey 12+. Manuka Doctor Manuka Honey uses the Total Activity system for grading their honey, which is different from UMF or MGO manuka honey. This large size jar of delicious 100% pure honey is handy for households that love honey! 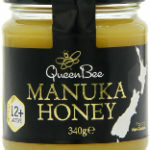 Queen Bee manuka honeys are delicious and creamy with high quality honey sourced from New Zealand.